Burgers are one of the foods I grew up eating as a child. I know it's not really healthy, but my parents have fed me tons of them for merienda during my grade school years. As I grew into a young adult though, I'd often skip this American favorite. However after paying a visit to Malcolm's Burger, I don't think I'll be able to help myself from eating these meaty treats. 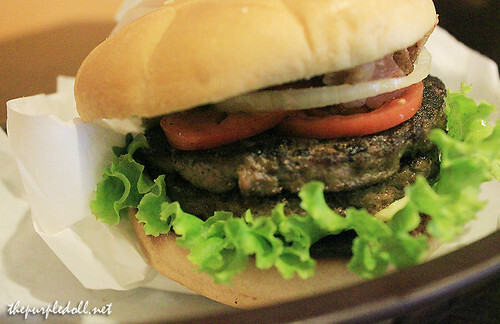 Malcolm's Burger prides itself with the Wagyu beef patty they use for their burgers. Yes, you read it right. They use the finest beef known for its lovely marbling. And, they can also boast for being the first one to start this trend in the Philippines. If you are familiar with the fine dining restaurant at Salcedo Village that is Malcolm's, this burger house is their American diner venture with friendlier prices of course. So when we were invited to try out some of the food at Malcolm's Burger, how can my date and I (with our grumbling stomachs) say no? This particular branch in PDCP Building, Makati is quite small and only has a seating capacity for 8 to 10 people inside, and about 8 to 10 more in their outdoor seating area. Its staffs however, were all very accommodating and all radiating a positive vibe even before we told the manager our names. 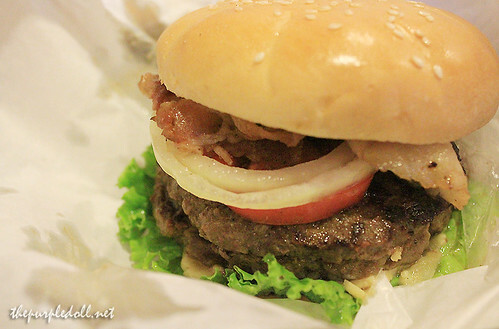 Malcolm's Burger offers a few types of hamburgers, but I found myself drooling for their Ultimate Bacon Cheeseburger (P140) because anything with the words ultimate, bacon and cheese is good for me. I also got my burger with an extra Wagyu Patty (P80) since this will be my big brunch. Although it was quite hard to bite through all the layers of meaty goodness, getting my face dirty just to eat my burger was all worth it. The Wagyu patties were so tender, juicy and full of meaty flavors. The bacon was also cooked perfectly, not too hard and not undone as well. The burger was so flavorful that even without ketchup and mustard, the Ultimate Bacon Cheeseburger was still very tasty. My date on the other hand, got himself a Butcher's Burger (P190), a double patty burger also filled with bacon, cheese and veggies. You might think it's almost the same with my Ultimate Bacon Cheeseburger. 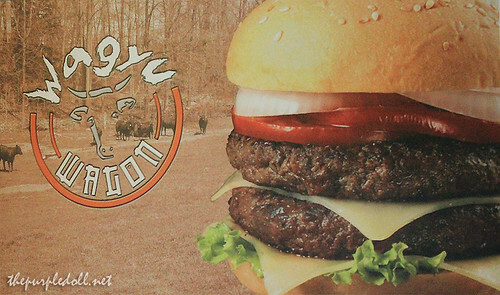 However instead of using plain Wagyu beef, the Butcher's Burger uses seasoned beef patties. Although the patty of the Butcher's Burger is not as meaty-tasting as my Ultimate Bacon Cheeseburger, it was bursting with flavors. It was also seasoned really well and my date totally loved it. 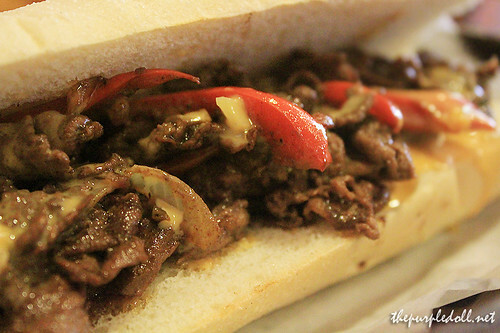 My date was constantly checking out the framed photo of one of Malcolm's sandwiches, and we were surprised when Mr. Benjie, the store manager offered to let us sample that particular item -- Malcolm's Philly Cheese Steak (P220). Like the burgers, this sandwich at Malcolm's also makes use of the finest beef in town. This time though, it's Wagyu Sukiyaki topped with grilled bell peppers, onion, cheese sauce, balsamic vinaigrette, and sandwiched in a French baguette. We were also offered some sides to go along with our burgers and sandwich. 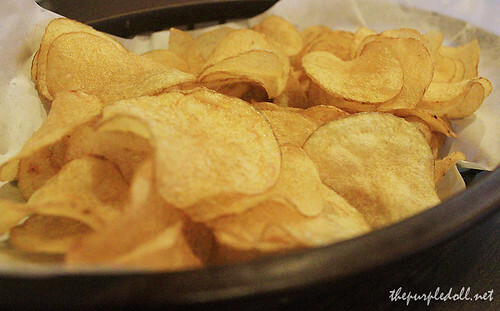 I got an order of Potato Chips (P35) while my date had Onion Rings (P75). 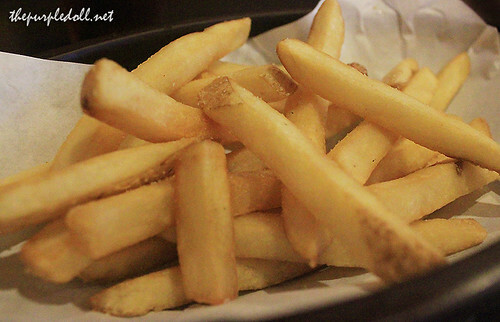 We were also given their French Fries (P75) to sample as these are the favorite siding of most of their patrons. 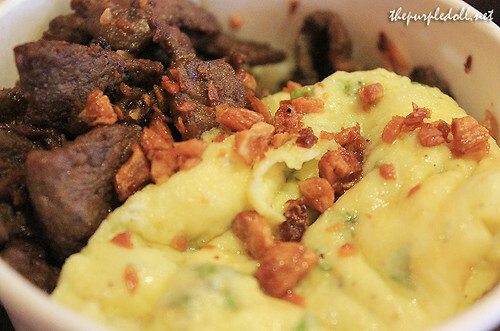 Tastewise, these sides were not really too different from the offerings at other diners. However I love the fact that at Malcolm's, they make sure to serve everything fresh. So each of our orders, from the burger to the sidings, were all cooked as we order. We were already full after the hearty burger galore. But before we finished our sides, Mr. Paolo, another manager of Malcolm's, joined us for a short chat and insisted we give their rice meals a try. Even with full stomachs, it was hard to say no to the very friendly and bubbly manager. So yes, we got to stuff ourselves with one of Malcolm's bestsellers, the Tapa Rice Meal (P140). Malcolm's Tapa is also made of Wagyu beef. It comes with scrambled eggs, rice and fried garlic bits. Although my date and I were already full, just the aroma of this rice meal already got us digging in. As expected, the tapa was tender, moist and very flavorful. It was so good that we finished the whole tub! After the tasting at Malcolm's, my date and I were almost about to explode. However, we are very fortunate to have stuffed good food in our already-bulging stomachs. Everything we've tried -- the burgers, the sandwich, the rice meal and even the sidings were all good. 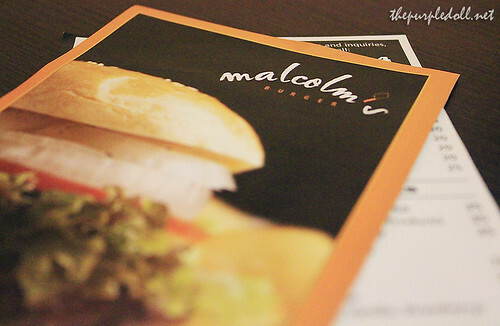 We may not be burger connoisseurs, but trust us when we say that Malcolm's Burger will not disappoint. Oh, man. I think i recall seeing a malcolm's burger somewhere. It must be this branch from makati coz we don't really go anywhere else (well except from ortigas where i used to work and rob ermita). I'll mention this to my hubby, i know he'll be interested in trying it out! 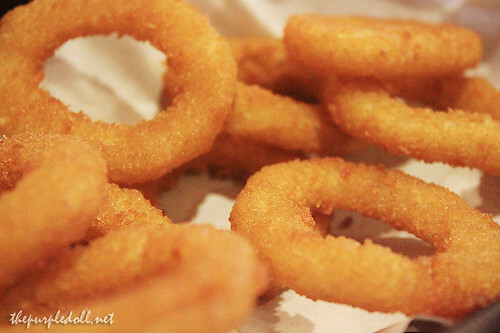 We're tried a lot of burger joints and malcom's has always been one of those we want to try next. There's one near DLSU but never got the time to try it out. @winter: Make sure to try it soon.. :) Their burgers are really good. Kidding aside, something to try soon with my bf. Thanks again Sumi! Yummy! But I only have one favorite burger, the mushroom cheeseburger from Jollibee. Too bad they no longer serve them. argh this'll make me forget my new year's resolution lolz "diet"
You make me soooo hungry Sumi! It's not as expensive as I thought it was! Nice!! thanks for this post, it makes me wanna eat burger now! lol! Pag ako kumain ng burger, double patty talaga kasi di ako satisfied pag isa lang. lol! I'm sure magugustuhan ko ang burger nila to think na Wagyu ang gamit nila! Happy New year! Btw, Sumi, would you mind if I borrow your rating guidelines (yung out of five ratings)? :) I think it would be helpful for my blog rin kase eh. ang ganda ng mga pictures mo/ love eat! wow and it's not that expensive too! akala ko mahal eh, nice nice! This was actually one of the first reviewws in En Route. And yes: The Wagyu Burger is good :D ! We had this with some white wine, while Lynne had it with white wine and watching Christiano Ronaldo. I've never seen her so distracted.